If you are looking for information on the C&N Publishing franchise business opportunity, C&N Publishing franchises or C&N Publishing franchising, then you have come to the right place. We have designed our system for individuals who like to sell. You network in your community, sell advertising, and select pre-written articles - we do the rest. 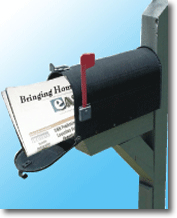 C&N community newspapers is a sophisticated direct mail advertising system - that works! As reported in American Printer Magazine, "Annual spending on U.S. direct mail advertising is approximately $60 billion a year, and it's growing at a healthy clip: seven to eight percent a year... There are a number of reasons for the growth of direct mail, but it really boils down to one very simple fact: Direct mail works." For over 16 years we have successfully owned directed mail community newspapers and have found our business to be both profitable and enjoyable. Our community newspapers positively impact the communities we serve. We are an affiliate of C&N Publications, Inc., a well-known owner of eleven direct mailed monthly community newspapers in west central Florida, in business for over sixteen years. C&N Publishing, Inc. was recently formed by the same owner to facilitate the franchising of our successfully proven system. When you join us, you'll benefit from our years of industry experience. What Makes a C&N Franchise Unique? We offer the unique opportunity for individuals to become "The Owner" of their own community newspaper without the expense of equipment or steep learning curve. C&N performs all back office functions so the franchisee can focus 100% on community related issues and support for local businesses. Our owners network in their communities, sell advertising space to local businesses and assemble editorial content. We handle the layout, graphic design work, printing, labeling and mailing. Who Should Consider a C&N Franchise? Owning a community newspaper requires the right mix of skills, background, motivation and financial stability. We believe that it is essential to award franchises only to individuals who fit our profile for success. Possible candidates would include individuals with sales experience and who are focused and hardworking. A prospective franchisee must also enjoy being involved with the community. We offer extensive classroom and field training for franchisees to ensure that individuals are fully trained to succeed. In addition to the initial training, we also provide ongoing support and training. Exclusive Territories Are Now Available Across the Country! C&N offers exclusive distribution territories across the country. A single territory will contain between 14,000 and 16,000 homes and businesses. We assist in territory selection to ensure a successful demographic mix. We are currently offering franchises in thirty-five states: Alabama, Arizona, Arkansas, Colorado, Connecticut, Delaware, Florida, Georgia, Idaho, Iowa, Kansas, Kentucky, Louisiana, Maine, Massachusetts, Michigan, Mississippi, Missouri, Montana, Nevada, New Hampshire, New Jersey, New Mexico, North Carolina, Ohio, Oklahoma, Oregon, Pennsylvania, South Carolina, Tennessee, Texas, Utah, Vermont, West Virginia, and Wyoming.